To be honest I'm quite speechless at the moment and it's not because my Monthly Challenge project would be something extraordinary. Simply I was trying to do so many things today and also wanted to finish this blog post before September arrives. Some people say they work better under pressure and get more things done and it's true, but it can be nerve wrecking too. It is second month in a row when I'm challenging myself with bracelets and I am having great fun. As you can see I have gone big and bold with them! This time I wasn't worrying too much about colours and finish, just wanted to try an idea. 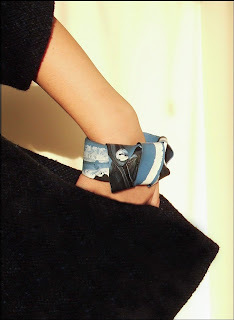 My intention was to make wide bracelet with strip of clay twisted around. At first I was planning to attach strip to the bracelet but then decided to make bracelet separate and form strip of clay separate. Next step after sanding was to twist strip around in desired way and fix it with button detail! It is quite simple project but I will keep exploring and better sketch and write down all the ideas I had during making process before they are gone. I'm looking at the picture on the top and it feels like I have just created new accessory to go with my wool jacket. Great, roll on September! Here comes my monthly Thursday Afternoon Notes blog post. And just to make it a little bit different than usually I will go backwards in week. So what I have been up to today?! Week: August 23rd - 29th. Back to Etsy, August 29th. For many children and their parents it's back to school or first day at the school here in Ireland. For me it is editing photos and updating our ETSY shop. 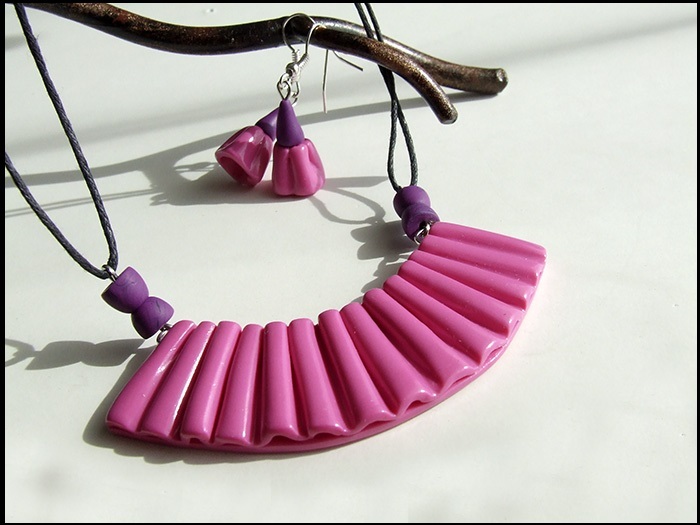 New Fuschia Pink and Purple Accessories at our Etsy store now. After a morning visit to the lovely Altamont Gardens and The Walled Gardens café I was happy to play at the clay table today. 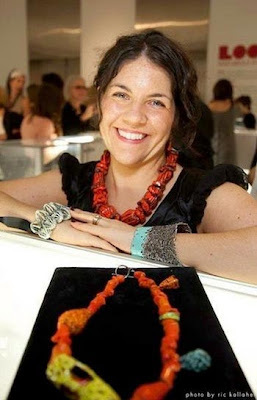 Accessories worn by talented Liz Schock in the picture on the right inspired me for my monthly challenge project. I fell in love with the wide cuff BRACELET from the first moment I saw it, but I have to say my bracelet developed into something completely different. I hope to post my finished piece this Saturday! Today we are educating ourselves behind the pile of papers and searching for different directions in our heads and online where Valg Studio could go in the future. Exciting!!! Despite the fact that this is time consuming it is GOOD to put the plan together. What people do when they don't have all the ingredients to cook the meal they have planed?! Cook the dish they have all ingredients for? I forgot to buy carrots and just said I'll go and check in the garden. Of course I knew that I have about 10 carrots TRYING to grow, but I didn't expect them to be big enough. Probably because in the previous summers I failed to grow them I was happy as child to find out that they have grown so big. I guess the warm summer had its effect. The Taste of Carlow Weekend, August 24th & 25th. 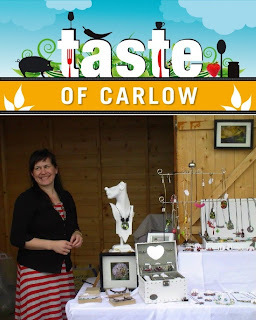 Taste of Carlow Craft & Artisan Food fair will always be close to my heart because it is my local fair and also I remember my first experience here last year when Valg Studio started to take part in craft fairs for the first time. I even looked at photo on our Facebook page from that day, I had great time. I want to admit that Taste of Carlow has grown since. I was surprised and glad to see so many wooden chalets taken by old and new artists and craft people. If you are looking for something special and good quality handcrafted items - this is a fair you can go to. I hope it continues to grow and improve with every fair! Thanks to James form James Dominic Music for capturing some lovely moments from the fair including this one. We are busy preparing for the Taste of Carlow craft fair tomorrow as a part of Carlow 800 celebrations. Thinking about different display ideas, packaging stock and also finishing some earring beads by adding last coat of glaze. That's it for the moment, hope you enjoyed reading! Almost every day we learn something new, gain experience, come up with new ideas and connect little pieces of puzzle to achieve something. Recently in a cupboard I came across this kitchen tool holder which I haven't used for years and was thinking to bin it or to do what? And then suddenly few moments later I knew exactly what I will do. 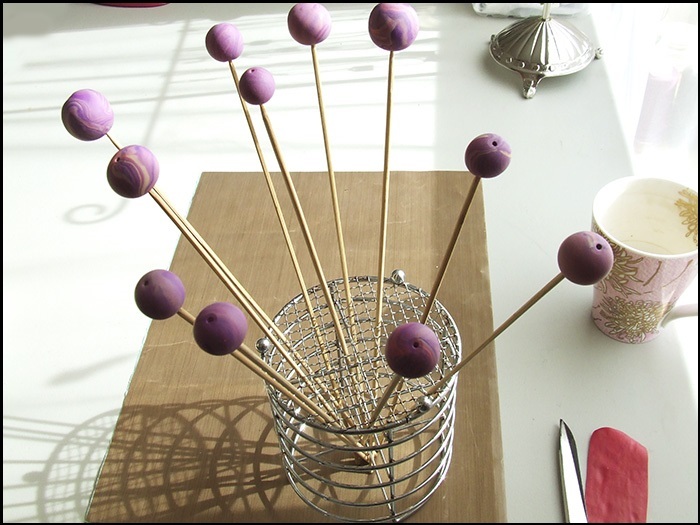 It will be my NEW GLAZED BEAD HOLDER! 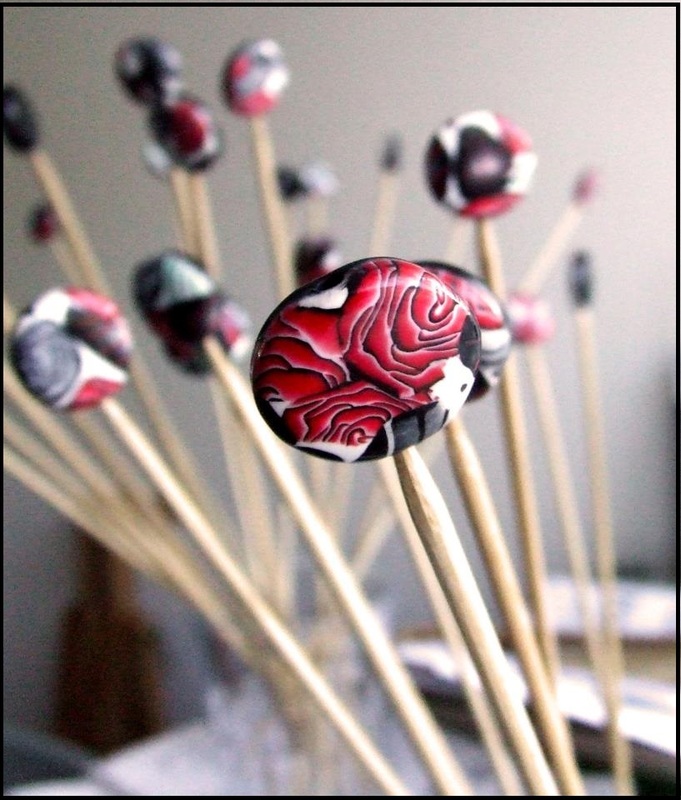 When polymer clay beads are cured there are few choices how to finish them. 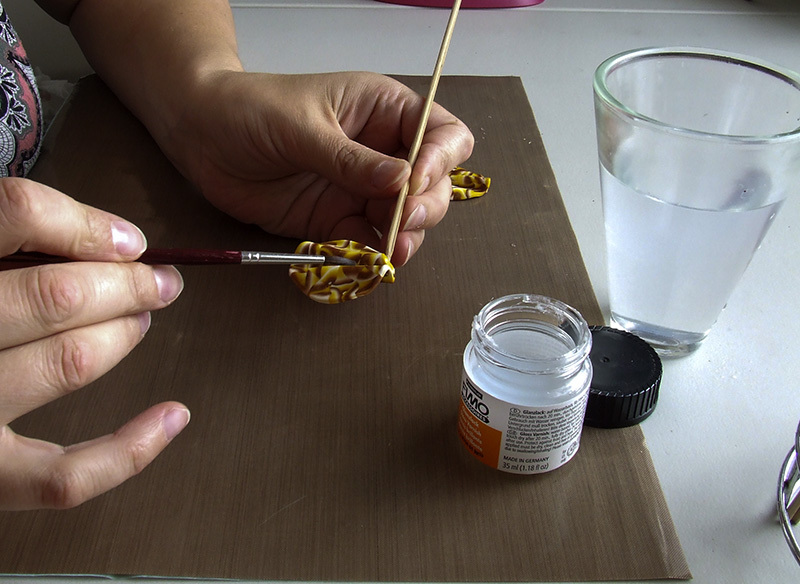 I like to give the beads lovely shiny finish by glazing them. Basically I pop beads on the sticks and coat them with tiny layers of glaze. Before I just used empty jar to hold the sticks but sometimes if I would have many beads they could slide and stick together. I am so glad I could put this unused kitchen tool holder in a good use by just turning it up - side down. It's bottom part now makes perfect base for holding sticks. This is great, I'm telling you! August is busy month in our house. There are two Lions in our family having their B-day candles to blow and celebrate, and we are also busy taking part in three Festivals during this month. 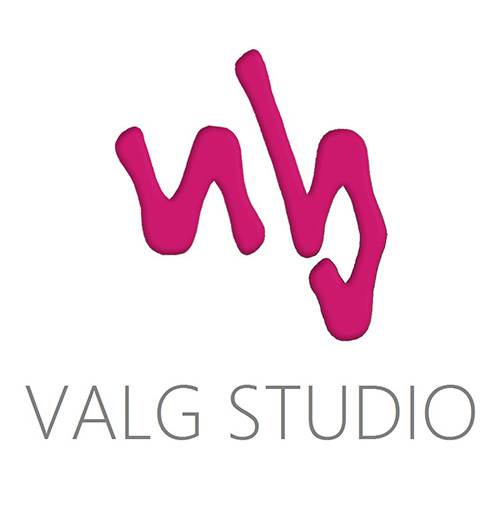 Valg Studio stand at GoreyCreative Fair during Gorey Market House Festival. Gorey Market House Festival during August Bank Holiday Weekend was great place to be. Valg Studio joined GoreyCreative Craft team at the beginning of this year and of course we were very excited to take part in Festival Fair. 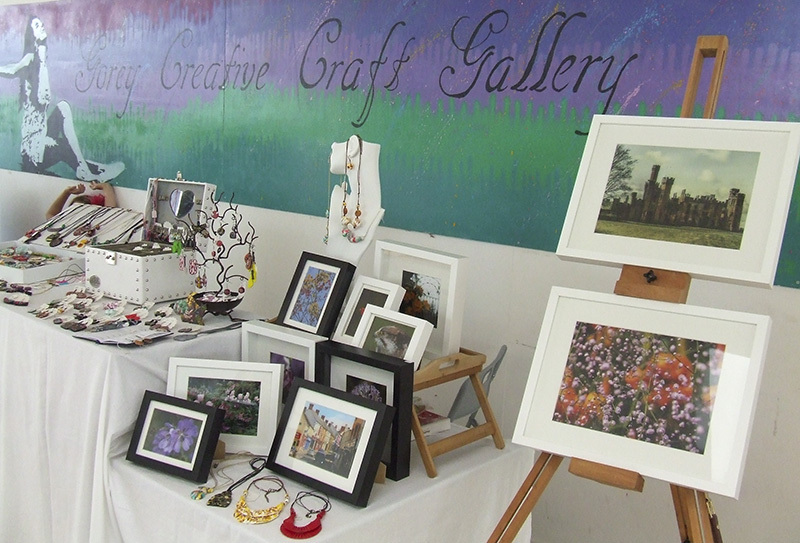 With no hesitation I can admit that GoreyCreative Craft Fair is one of my favorite fairs. It has great atmosphere, good quality and variety of original craft and art items. Only four days left! You will find more details about Kilkenny Arts Festival HERE. At the moment Valg Studio polymer clay jewellery and framed photo prints are available in wonderful Craft Fair at Mother of Fair Love School on James Street during Kilkenny Arts Festival. Beside meeting our lovely customers and visitors I always find it interesting to meet and learn about other craftspeople and artist work. This Craft Fair is no different - Kilkenny Black Marble, watercolor paintings by Raymond Osborn, modern knitwear for children by Brenda Cleere, textile artist Áine Maher, talented Linda Pearson and many more are there. I hope you will agree that it is always interesting to learn a little bit more about creative process and person behind his/her work. Visit Carlow Tourism for more information about upcoming events. Next week we are looking forward to Carlow 800 Celebrations. Wonderful opportunities of indoor and outdoor events celebrating the best Carlow has to offer. 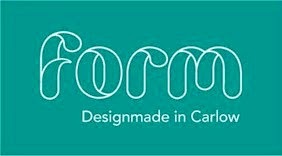 Come and visit us at Taste of Carlow Craft and Artisan Food Fair at the River Barrow Promenade on 24th & 25th August. Meanwhile new work is in the progress here at Valg Studio and I should be able to share it with you very soon! Better late than never. I will use this lovely phrase to smooth out my little delay with Thursday Afternoon Notes July post. I had wonderful two week holidays in Latvia and therefore this post will have more holiday feel. Week: July 26th - August 1st. The Wedding Day, July 26th. It wasn't my wedding, but it was most amazing wedding I have been invited to. My brother got married to his fiancee last weekend and had amazing countryside style weeding in the barn and guests sleeping in the tents under apple trees. Real summer treat straight from the plum tree. Pitty I couldn't eat them all. Day after crazy dancing all night, July 27th. It was wonderful relaxing day with my family and friends. I am so proud of my parents. Was amazed to see them playing volleyball! Aren't these flowers just so beautiful! This year they were specially grown in the farm for the wedding. Me and my sister decided to capture some moments while the flowers were in full bloom. Rewarding beauty after all the effort and timing. Start of a New Week, July 29th. Some people don't like Mondays in general. I don't mind Mondays, but this was bad day for me. I received two news that made me feel very upset, but it's good that I was able to share my feelings and now I think it was a good lesson. And to wash all sad thoughts away completely I enjoyed this lovely sauna at my parents farm. Actually I enjoyed it every evening while I was there. Beautiful from outside and relaxing inside wood-fired bathhouse or Latvian sauna. In the early hours of the morning we started our journey back to Ireland. 14 hours later tired but happy we returned home in Tullow. Back in Action Wednesday, July 31st. Washing, cleaning, answering emails, watering plants and doing all those other little things to get on smoothly after break. Especcialy enjoying gooseberry jam I made just couple hours before we left for holidays. It's August already, August 1st. The best news of the day are that Blog Awards Ireland has extended the nomination date by a week for six categories including Craft. I know couple lovely craft blogs I would like to nominate. If you like to do the same just press HERE!